Titled: "The Hotel Dieu, Montreal, PQ"
Image Size - w: 10" by h: 7"
Take note: This is a fine clear impression in warm black ink. 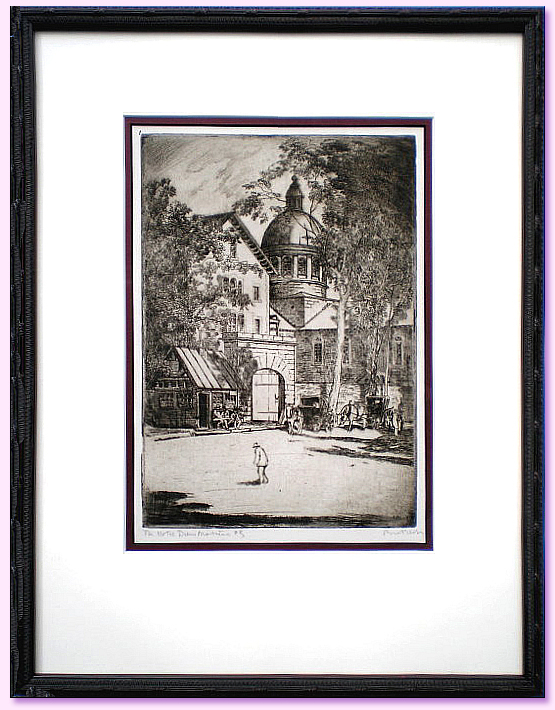 This drypoint etching is pristine, with no condition issues, printed on cream wove paper with full margins. This is a rare edition of possibly 25 impressions hand-pulled. 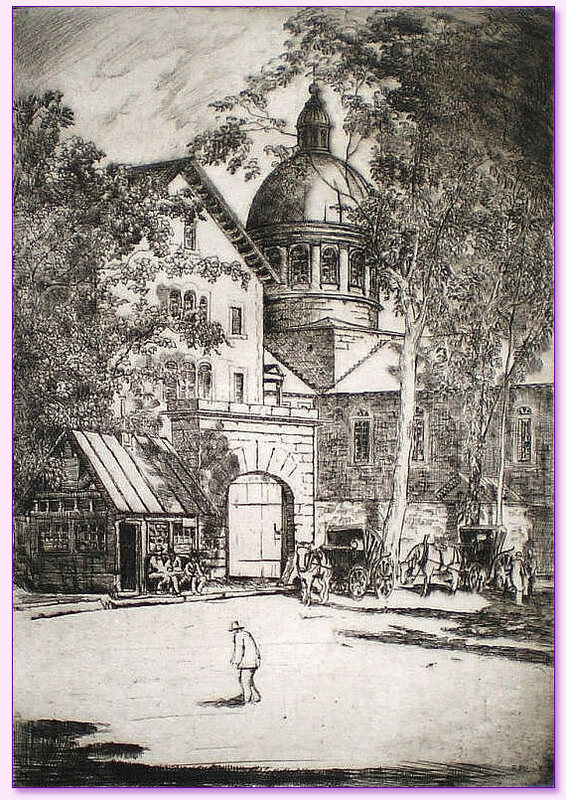 Though this print is signed in english, Robert Pilot occasionally signed this etching in french with the title "L'Hôtel-Dieu à Montréal" for his Quebec patrons. Robert Pilot was born in St. John's Newfoundland in 1898. His mother was widowed when Robert was young, but remarried to Canadian artist Maurice Cullen RCA, in 1910 and they returned to Cullen's home in Montreal. Robert's early life revolved around his new step father's artistic livelyhood. In the studio he watched Cullen work on many important paintings and experienced the excitement of visits by artists, architects and collectors. This gave him the opportunity of learning his craft from the bottom up in the tradition of the apprentice painters of old. Later he attended night classes at the Royal Canadian Academy where he continued to study the human form working from the live model under the direction of William Brymner. Brymner offered him classes at the Art Association of Montreal and, knowing that the boy had no money, told him he could pay the Association later, ". . . in ten years' time, or whenever you have the money." So Pilot started classes and continued there until March, 1916, when he enlisted for active service in the army during World War I. In the spring of 1919 he returned to Brymner's classes and there won the Wood Scholarship. Considered exceptional for his time he was invited to participate in the very first Group of Seven show which was held in May of 1920. 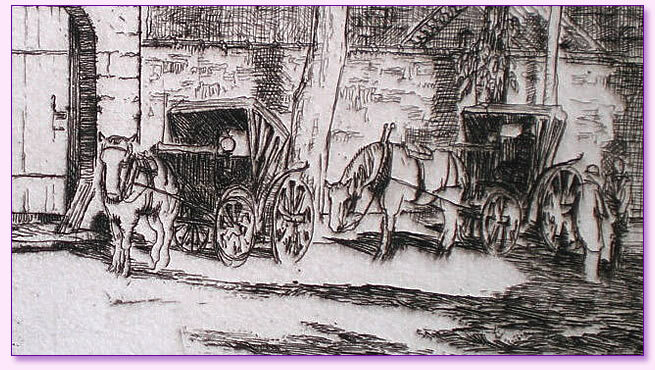 He felt somewhat overshadowed by his stepfather in painting so he decided to develop his skills in etching as his stepfather did not work in this medium. 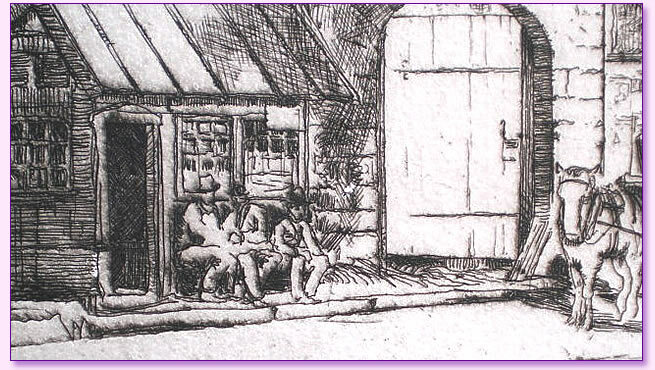 He made over twenty-five etchings of which nearly all of were Quebec City, Montreal and its suburbs which were considered by noted art dealer William Watson, ". 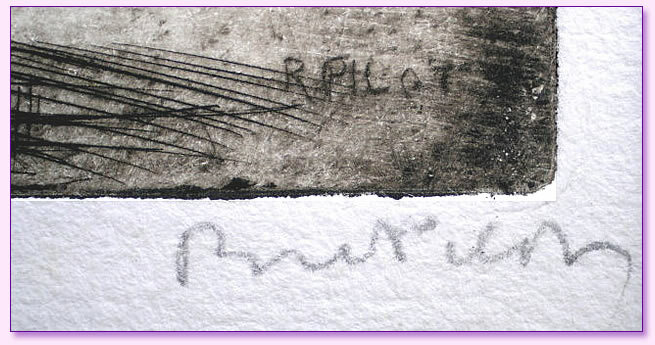 . . the best etchings ever made in Canada." Throughout a career of half-a-century, Pilot quietly explored the impressionist vein of art. Although aware and appreciative of the works of other, more volatile artists, he was never tempted to stray from the artistic tradition which best suited his temperament and purpose. Pilot was particularly attracted to those quiet hours of dusk in winter when the last wash of sun is still in the sky and the first lights of evening are being lit. Robert was a member of the Royal Canadian Academy and President in 1952 to 1954, he was also a member of the Ontario Society of Artists, the Canadian Group of Painters, the Pen and Pencil Club of Montreal as well as being a Member of the Order of the British Empire. Robert Wakeham Pilot died in 1967.